Fans near Murphy's Bar and Grill jammed Merchant Street during last night's nationally televised football game between Hawaii and Nevada. The Warriors finished their road schedule with five wins and no losses. The Hawaii Superferry plans to resume daily trips between Oahu and Maui on Dec. 1, but no date has been set for service to Kauai. The new facility is free and convenient for users that would normally drive around the airport dodging security or pay for parking. Those critical of the proposed luxury development at Laau cheered after the large landowner withdrew its impact study. A 63-year-old McCully woman was crossing King Street in a marked crosswalk at about 11:20 a.m. yesterday when a car hit her. Rivky Krasnjansky of Honolulu and Avremel Chazanow of Brooklyn, N.Y., believe that God will be a third partner in their marriage. In a season full of miracle road finishes against the odds, the 13th-ranked Hawaii Warriors out-did themselves last night at Nevada's Mackay Stadium. The music matched the tone set by Jamie Houston as "U Can't Touch This" echoed throughout the Pan American Center. 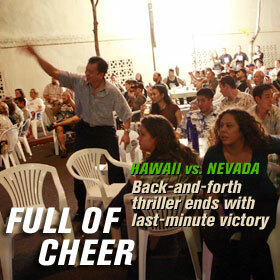 The Hawaii basketball team saw a game come down to the final seconds and left the court stunned by a heart-breaking loss. Inflation and personal income are expected to remain stable at 4.5 percent for 2007. Bernard von NotHaus launched the new currency here and says holders have nothing to worry about. Mayor Hannemann has proposed that a panel of experts pick the city's transit system mode.